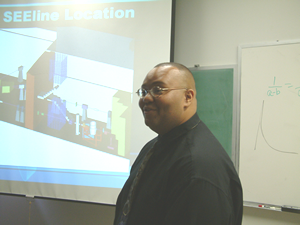 Each summer the Texas A&M Cyclotron Institute, in conjunction with the National Science Foundation, serves as a Research Experiences for Undergraduates (REU) site. 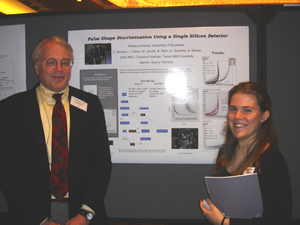 The Institute’s REU program focuses on research in nuclear physics and nuclear chemistry. Students are given the opportunity to work closely with internationally renowned scientists at our facility. Undergraduates gain research experience by carrying out specific projects under the direct supervision of the Physics and Chemistry faculty at the Cyclotron Institute. 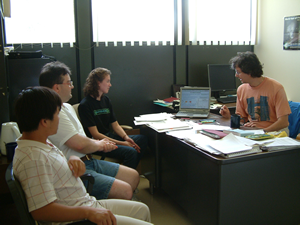 Weekly discussions on forefront areas of Nuclear Physics/Nuclear Chemistry are led by Institute faculty. At the end of the ten-week program students have the opportunity to share their work via an oral presentation and poster session. After spending the summer at the Cyclotron Institute many students go on to participate in the Conference Experience for Undergraduates. This allows them to present their research to a wider audience and gives them the opportunity to make contacts for potential graduate study.